Clackamas wide receiver Richard Kennewell is turning into a touchdown machine -- and he doesn't seem to have an "off" switch. Kennewell caught touchdown passes of 16, 24, and 83 yards Thursday night as the No. 2 Cavaliers pulled away from turnover-prone Reynolds for a 38-12 victory on "Senior Night" at Clackamas High School. Noah Hobbs and Anthony Talavera added touchdown runs to help the defending Class 6A state champion Cavaliers improve to 7-0 overall and 2-0 in the Special District 4 standings with two games remaining in the regular season. 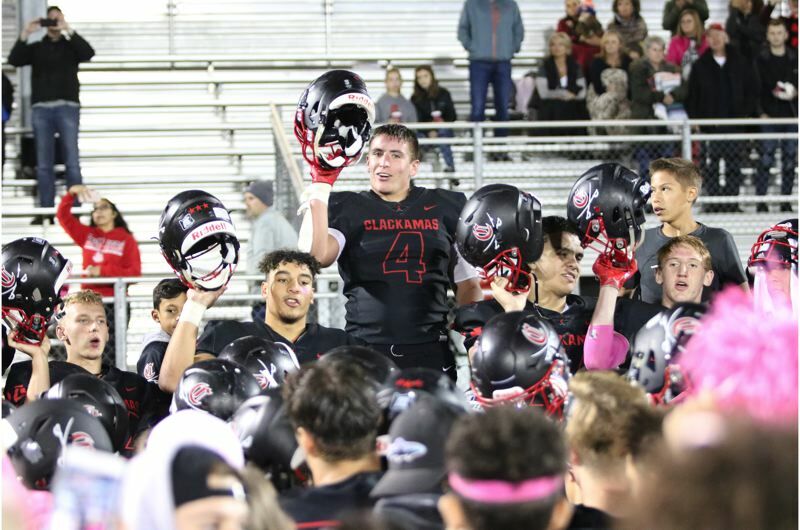 "I was treating this thing all week like it was a playoff game because I thought Reynolds had the potential to beat us," Clackamas coach Joe Bushman said. Reynolds (5-2, 1-1) came into game averaging 45.2 points a game and the Raiders probably would have put up more of a fight if they had just been able to hang onto the ball. But they lost three fumbles and threw two interceptions that knocked the legs out from under their upset bid. Clackamas defense also came up with an impressive goal-line stand midway through the second quarter when Reynolds had first-and-goal at the Cavaliers' 3-yard and came up empty on four run plays up the middle that netted the Raiders one yard. "I thought we had a good game plan against them," Bushman said. "We wanted to take away the dive, which we did for the most part. They're so athletic, we knew we'd give up a few plays here and there. We just didn't want to give up a big one in the running game." Then there was Kennewell, the 6-foot-3, 180-pound junior who caught only three passes in the game, but they were all for touchdowns. First, Kennewell caught a 16-yard strike from Caleb "C.J." Jordan that pushed Clackamas' lead to 17-6 with 36 seconds to play in the first quarter. Next, he broke loose on a seam route on the right side and caught an 85-yard touchdown pass from Austin Atkeson that made it 24-6 with 5:07 remaining in the second quarter. And, finally, he pulled in a 24-yard TD pass from Jordan to cap a five-play, 71-yard drive to open the second half and give the Cavaliers a 31-6 lead. "I think I'm doing pretty good," Kennewell said. "I'm just trying my hardest and balls are getting thrown to me and I'm making plays. It's fun. "I'm getting more confident, but I'm still staying humble. I don't want to be cocky." In seven games, Kennewell has put up first-team, All-State-like numbers with 26 receptions for 596 yards and 11 touchdowns. He also has caught two or more touchdown passes in each of the last four games, grabbing two against Lake Oswego, two against Lincoln, two against Gresham, and three against Reynolds. "Richard is a special athlete," Bushman said. "He has good speed and good hands, but the area where he's taken his game up a notch is his coach-ability. He's a really good team guy, he's paying attention to details, and he's really competitive. "I mean, if the ball is in the air, he's going to get that thing. We keep getting him some match-ups we want and he's able to exploit them. You know, we have other guys, too, but we weren't particularly sharp in the passing game tonight." Give the Reynolds defense some credit for limiting some of the Cavaliers' aerial options. "They definitely had something to do with it," Bushman said. "They have four really good athletes in the secondary who play good man coverage. "There were times when we had a step on somebody and then we didn't throw a good ball. And then there were times where they really just covered us well and they put some pressure on us, too." Atkeson completed 5 of 8 passes for 110 yards and one touchdown, and Jordan was 2 of 7 for 40 yards with two touchdowns and one interception. Hobbs led the Clackamas running attack with 16 carries for 51 yards, and Talavera had 11 carries for 39 yards, while placekicker Jeffrey Nelson got it all started with a 42-yard field goal and then went 5-for-5 on PATs. ""We were a little bit up and down on offense," Bushman said. "We had some big plays and I was encouraged by the way that we ran the ball at times in the second half. We weren't as consistent as we'd like, but hats off to Reynolds. They were physical up front and then they have some really good athletes in the secondary." Clackamas returns to action Friday with a 7 p.m. road game against David Douglas. A win over the last-place Scots (2-5, 0-2) would send the Cavaliers into the Oct. 26 league championship game against Friday's Barlow-Central Catholic winner to decide the outright league title.